When the wind blows, the lorries slow and the Port of Felixstowe is no-go, so down to Hamilton Road we go. 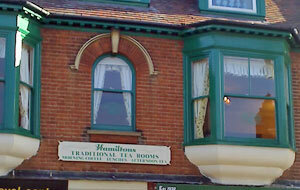 Number 134, to be pedantic, home to Hamiltons, "traditional tea rooms". As ever, check out the occasionally flaky map: who knows, you might find it on there. From the moment you enter, you realise that this place is a cut above, being at the top of a flight of stairs. Head through the door marked "Restaurant" and you've landed. Easy to imagine the chintzy interior featuring in a BBC Sunday teatime drama series, perhaps in a tea dance scene with the customers unwittingly acting as extras. How did some of these folk make it this far? Up the stairs, I mean. For lunch there's roasts and pies. My request for scrambled eggs on toast was politely declined and nearly gave rise to a Falling Down moment: sorry sir, that's not available after 11:30am. Opted for the available veggie sausages instead while the chaps chose fried Friday fish. My bangers were OK; the accompanying roast potatoes were terrific. Between courses, you can occupy yourself identifying all the famous Hamiltons on the wall: there's Neil & Christine above the window seat, FA Cup semi-final scorer Bryan in the corner, the 2007/2008 Academical team by the door, and, in pride of place above the fireplace, F1 Lewis. None of this paragraph is, in a strict sense, true. As you'd expect from a tradcaff, pudds are prolific. I heard myself ordering a bakewell pudding with custard, plus latte on the side. Well-presented coffee, lovely old school almond sponge. Next time you're passing Hamiltons, drop in. If it was a car -- Mercedes-Benz 240D. If they were passing by -- Jim Broadbent.